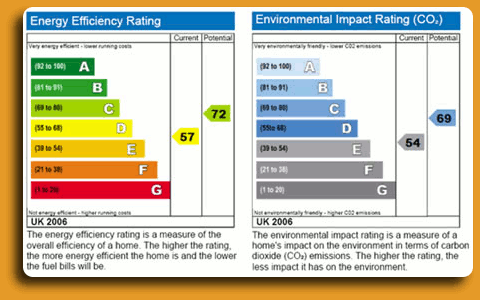 Energy Performance Certificates (EPC) tell you how energy efficient a home is on a scale of A-G. The most efficient homes - which should have the lowest fuel bills - are in band A. The Energy Performance Certificate also tells you, on a scale of A-G, about the impact the home has on the environment. Better-rated homes should have less impact through carbon dioxide (CO2) emissions. The average property in the UK is in bands D-E for both ratings. The Certificate includes recommendations on ways to improve the home's energy efficiency to save you money and help the environment. Contact HIP-Consultant.co.uk and arrange a Domestic Energy Assessment for your Energy Performance Certificate (EPC) or ask any questions you may have. HIP-Consultant.co.uk have a comprehensive provision in Energy Performance Certification and assessment, please see here for more indepth description of our HIP and EPC Services. Based on the domestric energy assessment by HIP-Consultant.co.uk's licensed domestic energy assessors (DEA) an Energy Performance Certificate (EPC) will be issued. The Energy Performance Certificate (EPC) shows ways on how to reduce your energy consumption and carbon footprint. These are often low cost measures which can be easily achieved with minimal cost, effort or disruption. Have a look at a full Sample Energy Performance Certificate (EPC). Why an Energy Performance Certificate (EPC)? The European Union has long been concerned about the energy efficiency of the building situated in its member states. In addition it was concerned about co2 emissions from properties and it's affect on climate change. In January 2003 the EU Energy Performance of Buildings Directive (EPBD) was made public. This directive will have a massive impact for awareness of residential properties or operations of commercial buildings as well as the development of new buildings. The EPC is the way in which the EU directive will be adhered to in the UK. Minimum requirements for the energy performance of all new buildings. Minimum requirements for the energy performance of large existing buildings subject to majority renovation. Energy certification of all buildings. Regular mandatory inspection of boilers and air conditioning units. Energy Performance Certificates (EPC) are part of Home Information Packs, which have been in effect since the 1st August 2007 in England and Wales for domestic properties. Energy Performance Certificates (EPC) are a result of European Union Directive 2002/91/EC relating to the energy performance of buildings. The directive itself was inspired by the Kyoto Protocol which commits the EU to reduce CO2 by 8% by 2010, to 5.2% below 1990 levels. The directive came into force on the 4th January 2006 and requires member states to comply with Article 7 (Energy Performance Certificates), Article 8 (Inspection of boilers) and Article 9 (Inspection of air conditioning systems) within 3 years of the inception date, the deadline being 4th January 2009. In the UK this directive was enacted in Part 5 of the Housing Act 2004. The Energy Performance Certificate (EPC) is based on the RDSAPv3 procedure, which is a simplified version of the SAP2005. SAP is short for Standard Assessment Procedure and RDSAP for Reduced Data SAP. The EPC will be produced by Home Inspectors or Domestic Energy Assessors (DEA) to be included as part of a Home Information Pack (HIP). In addition to the requirements in relation to dwellings there is also a requirement for Energy Performance Certificates (EPC) on the sale, rent or construction of buildings other than dwellings with a floor area greater than 500m2 from the 6th April 2008.